Motorists will need to slow down on Miller Drive in Sunbury after the Village Council unanimously voted to lower the speed limit from 35 mph to 25 mph. Council members said the new ordinance will go into effect as soon as the signs could be changed. Sunbury Police Chief Robert Howard said his officers will issue warnings about the lower speed limit for the time being. The 25 mph limit will apply to the stretch of Miller Drive between the intersection of State Route 37 and 3C Highway. That portion of Miller Drive runs behind the Sunbury Plaza shopping center, the Sunbury Pointe apartment buildings currently under construction, and turns sharply at General Rosecrans Elementary School. There is a marked 20 mph school zone at GRE. “Our concerns are with the school and the new apartments,” Howard said. 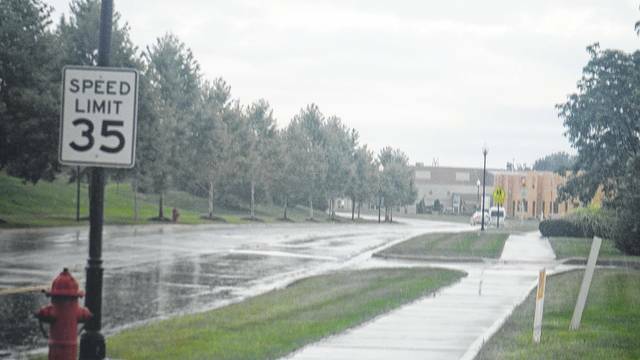 Prior to council’s vote, village staff said lowering the speed limit is in keeping with how most motorists would feel comfortable driving on Miller since it is a sharp corner. Village staff also said that the speed limit change was not meant to trap speeders, but to change behavior. “We have kids all over the place, and school has started,” said councilman Scott Weatherby. “Since the opening of said street [Miller] there has been an increase in traffic load due to commercial and residential development as well as the opening of an elementary school in the area which has caused the Village Council to review the posted speed limit,” read the legislation. The vote was 5-0 on Aug. 16, because councilman David Miller died Aug. 12. A memorial to honor Miller was presented by council, staff, and audience members before the meeting. Miller, who was appointed to council in 2012, was elected in 2013. He was president of council and served on many of its committees. Hatfield said council will wait before filling Miller’s seat. There are four candidates vying for four openings on council in the Nov. 7 election — incumbent Weatherby, along with Martin Fisher, Dave Martin, and Joe St. John. In other business, council voted to retain David J. Brehm as solicitor for the village at an annual salary of $86,260. The solicitor provides legal counsel and prosecutes all Mayors Court cases. Council will vote on another speed limit ordinance — reducing the speed limit on 3C Highway within the village limits from 55 mph to 50 mph — at a future meeting. One of the two 35 mph signs on Miller Drive between State Route 37 and 3C Highway that will be changed to 25 mph. Past the sign in this picture are the Sunbury Pointe apartments under construction.